Disclosure: I received samples from Influenster.com. All opinions expressed are based on my own personal experience. Your opinion may differ. I love nothing better than trying new products and sharing my experiences with others. 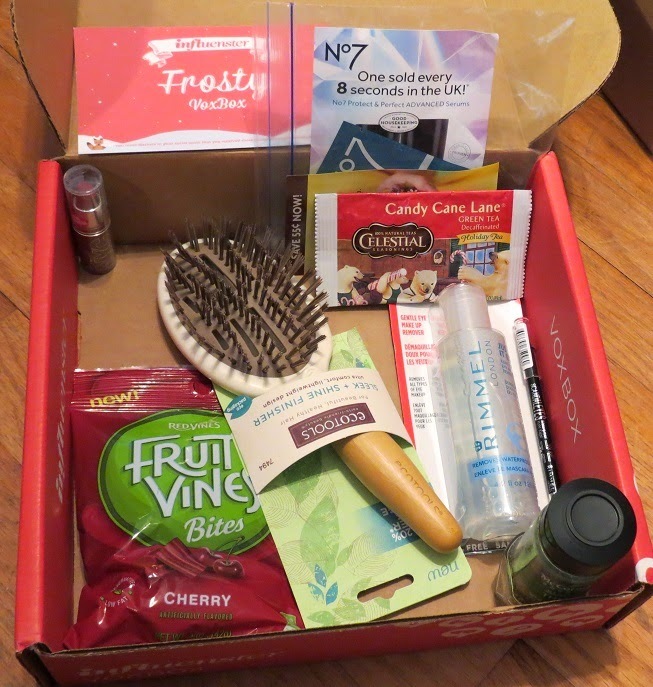 Recently, I received the #FrostyVoxBox from Influenster and I was thrilled with the products! 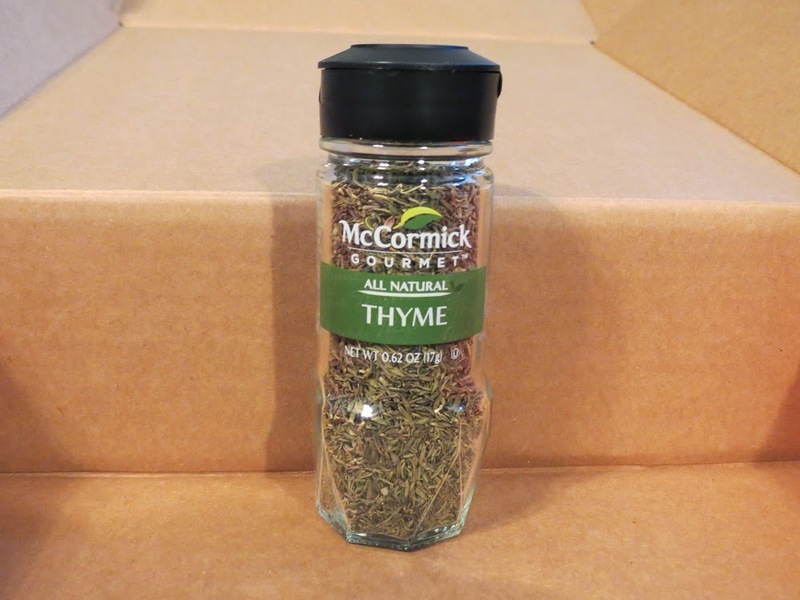 McCormick Gourmet Thyme- Chefy loved it! It is a high quality spice and added an awesome flavor to my meatloaf! We love the glass bottle. It opens and closes easily too. 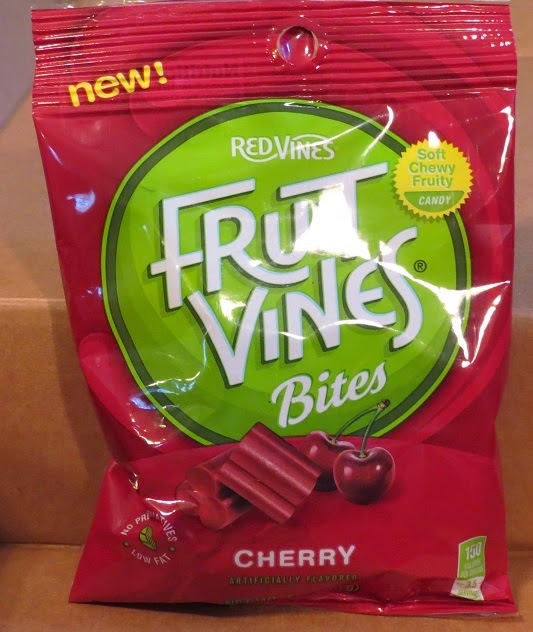 Fruit Vines Bites in Cherry Flavor- Yummy! My family really enjoyed the Cherry flavor. It was juicy and delicious. Lowfat/Kosher/Vegan. 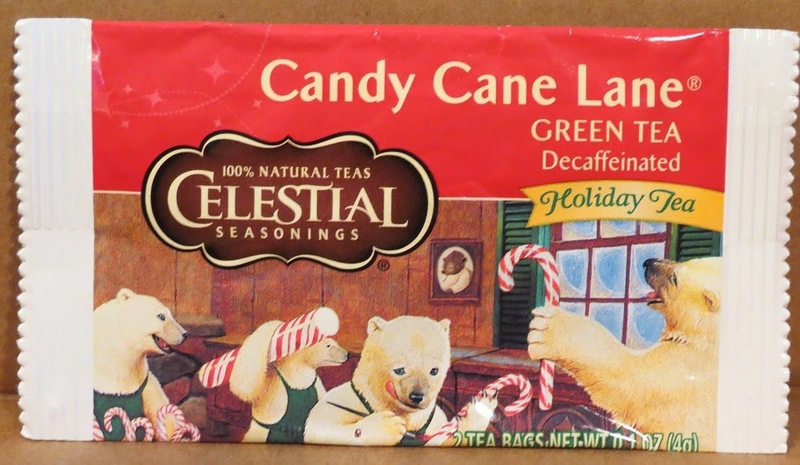 Celestial Seasonings Candy Cane Decaf Green Tea- My favorite! I generally prefer decaffeinated beverages, so this was a huge treat for me! It was a smooth, minty tea that was a perfect way to end my day! 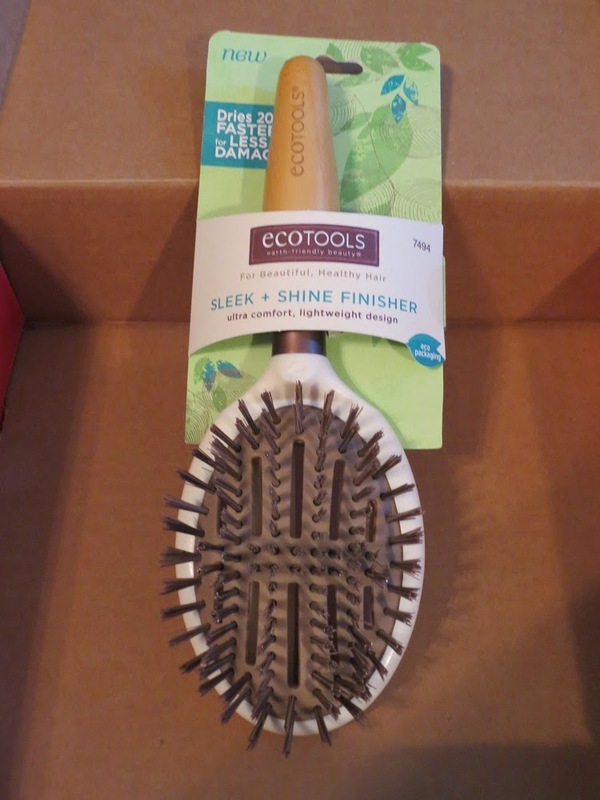 EcoTools Hair Brush- Kat and I loved this brush. It is lightweight and the bristles glide smoothly through my hair, minimizing breakage. The eco-friendly packaging and the bamboo handle are huge pluses too. Rimmel Gentle Eye Makeup Remover- I usually have skin issues with other eye makeup removers. This worked great on all my makeup, waterproof as well as the other products. It was very gently on my skin and it did not leave an oily residue. Dermatologist tested. Rimmel Scandaleyes Waterproof Kohl Kajal Eyeliner- I really like the pigment. It glided on smoothly and it didn't smudge or come off when I started sweating! Dermatologist tested. Boots No. 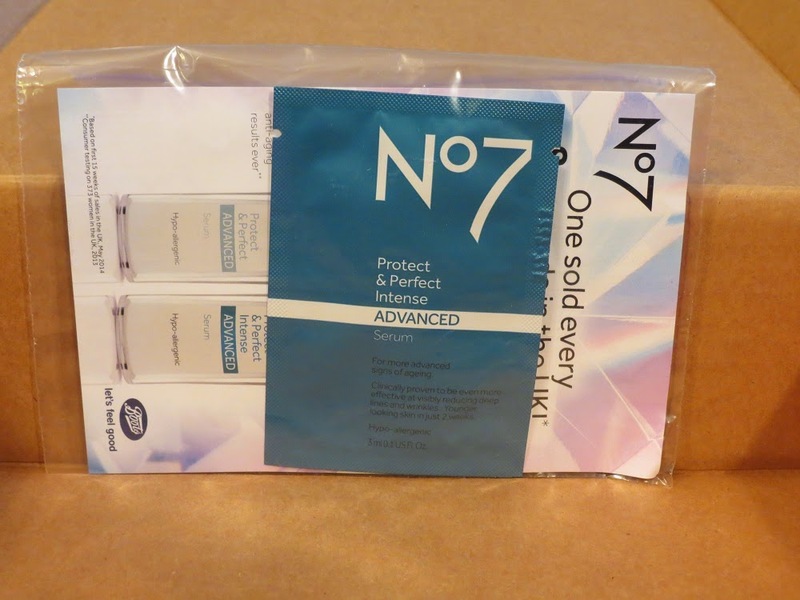 7 Protect and Perfect Intense Advanced Serum - This hypo-allergenic product works on deep lines and wrinkles! I liked the way it felt on my face, but it was scented. I would have preferred non scented! NYC Expert Last Lip Color in Sugar Plum- The color was perfect for me! It went on smoothly and lasted throughout the day! It did not feather, and it left my lips feeling nice and smooth! This was a great box! I cannot wait to see what the next VoxBox from Influenster holds!